Tell us about yourself! Where are you from? What kind of work have you done before joining the LTS program? Home is where I have loving family and close friends. I’m originally from the foothills of Colorado, but I’ve bounced between there, Germany, Austria, and South Korea before moving to Eugene with my wife, Jiyoon, last year for school. Growing up the Rockies, I’ve always loved being outdoors among nature. I like to snowshoe, camp, backpack, fish, and climb mountains. I spent nearly half of my childhood sleeping in tents in nature. I also love reading, cooking, gardening, building things, drawing, and I enjoy taking pictures when the mood hits me. When I have time and money, I love traveling, learning about foreign cultures, and trying to learn foreign languages. Actually, the experiences I had learning foreign languages have directly affected my teaching, and knowing a foreign language even helped me get my first language teaching job. I’ve had many jobs. My first job, when I was 14, was building hiking trails in the Rocky Mountains. 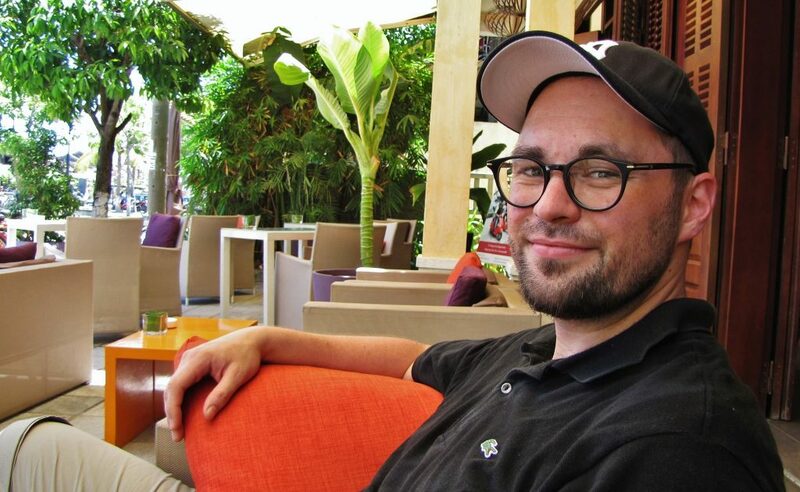 I have also worked in a kitchen, as a mover, a landscaper, in maintenance, for a political party, in an insurance company, and for a TEFL certification program. It wasn’t until about 7 years ago that I got my start in teaching ESL in the Denver area through some local non-profits. Since then, I’ve taught both English and German, and I’ve worked in adult education with immigrants and refugees, in the South Korean public school system, in an intensive English program, and now as a GE for the American English Institute’s matriculated international undergraduate classes. 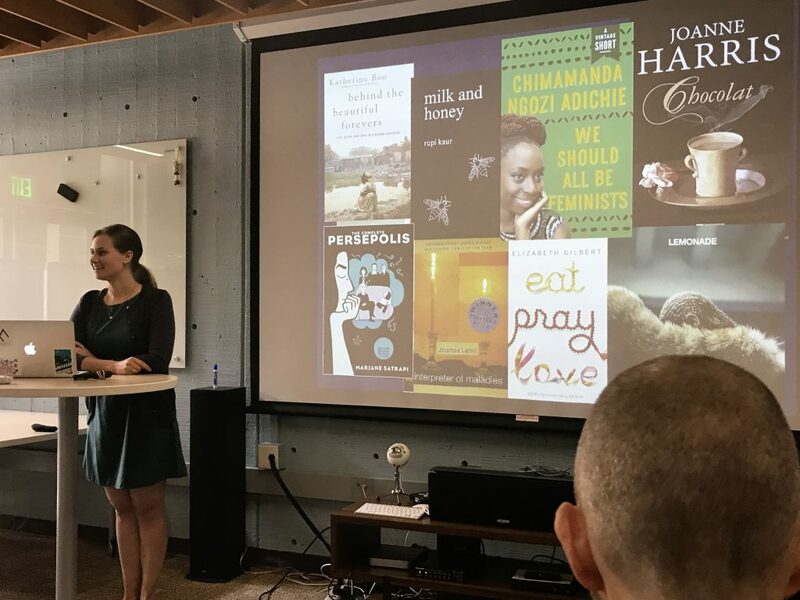 Each of those teaching contexts has brought with it a different perspective on how language is learned and how connections across cultures are made. I’ve always tried hard to make a connection and build a relationship with my students. Having learned foreign language, having been an exchange student, and having worked in a country where I was a minority have helped me relate to my students’ experiences. I’ve worked with a lot of students from many of different backgrounds, and I always aspire to be a positive influence in their lives. In turn, they’ve always impressed me with their perseverance, and my heart sings when I see them succeed using something that I helped them discover. Tell us about being a GE with the AEIS program?. What does that entail? It’s busy. Seriously though, I have nothing but positive things to say about my experience working as a GE for the AEI. They have a wonderful supportive and expert staff, and there are tons of opportunities for professional development offered through the AEI’s programs. I was even able to showcase a unit on teaching debate at an in-house poster session at the AEI which some of the staff have been using in their work. Teaching the AEIS classes is also a perfect opportunity for me to get my feet wet at an American university level of ESL instruction. I taught AEIS 102 – Advanced Academic Oral Communication in the fall, and I’m currently teaching AEIS 112 – Written Discourse III (Research Paper). One benefit of being a GE at the AEI is that I can complement my classes with the research and coursework that I am doing in the LTS program. 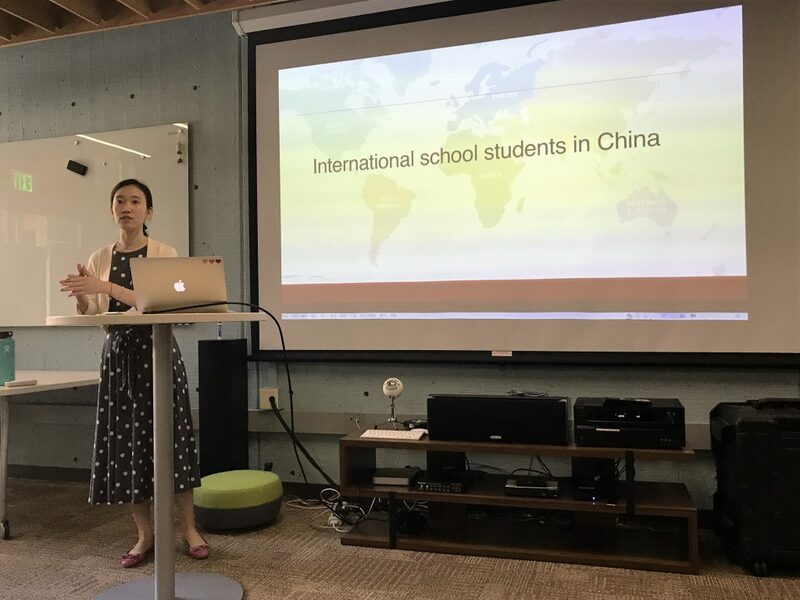 I am happy that I’m able to incorporate research-backed strategies and pedagogical approaches in my lessons to help our international undergraduates develop the linguistic skills that they need to thrive in the university context. I have also been able to utilize some of the CALL aspects that I’ve learned as an intermediary for supplemental instruction. The synergy created between both places is also really helping challenge me on a new level of instruction and to think beyond my previous language teaching experience, especially on the curricular level, and I am just happy to be a part of both programs. I will say that working at the AEI as a GE does have its challenges. Being a sole instructor allows me the freedom to take control of the course curriculum so long as it aligns with the course goals, student learning outcomes, and assessment. However, with that, there is a lot that I need to dedicate towards planning and structuring of both the lessons and curriculum, as well as with providing students with useful feedback. Luckily, the methods and pedagogical approaches that I am learning as an LTS student can be directly applied to my courses, and I can develop my curriculum beyond a holistic level. I can see my growth as a language teaching professional, and seeing my students succeed makes the extra effort worth it. It’s getting close to Master’s project time. Can you tell us a little about the ideas for your project? My proposed MA project is inspired by my first AEIS 102 course that I taught in the Fall 2016 term. 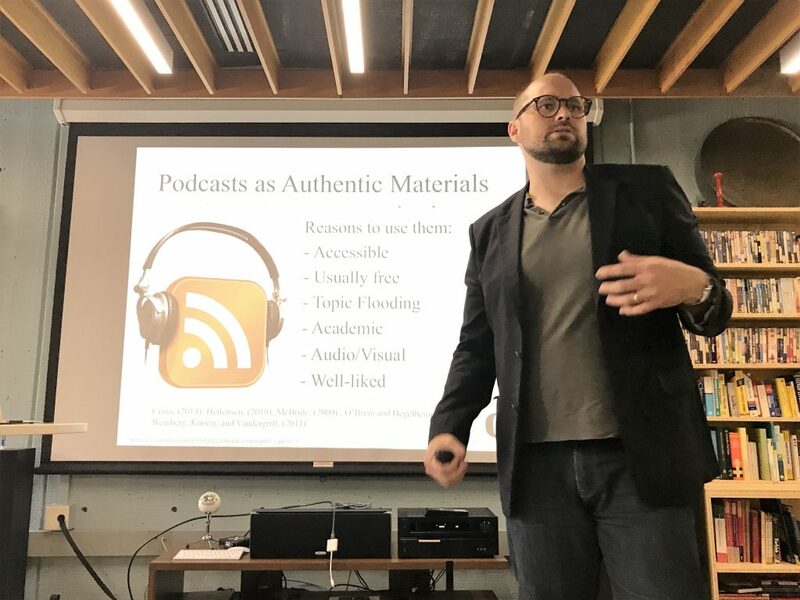 I was looking for authentic materials to use to help my students build listening strategies when I noticed that I kept coming back to public radio broadcasts not only to set the context but also to structure the lessons. 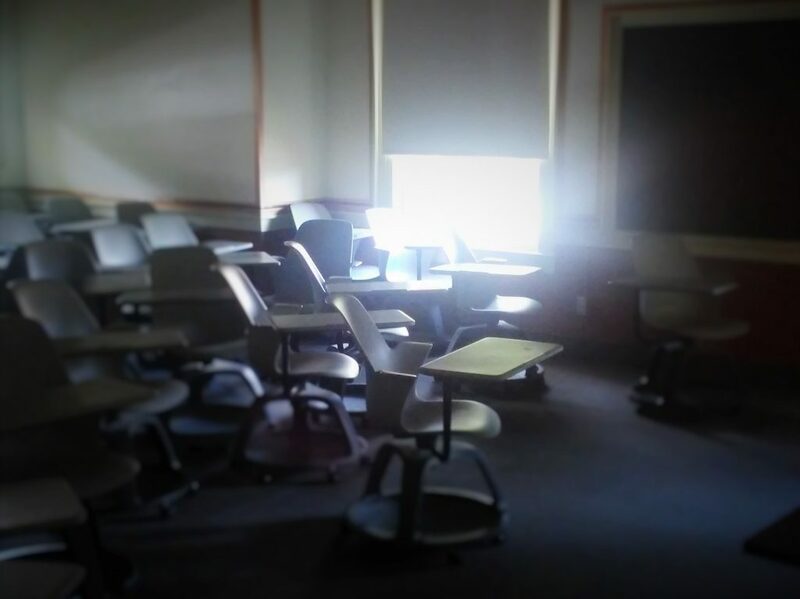 When I used them in class, I received a lot of positive feedback from my students, and I was surprised how much of a diverse plethora of contexts and genres that were readily available. 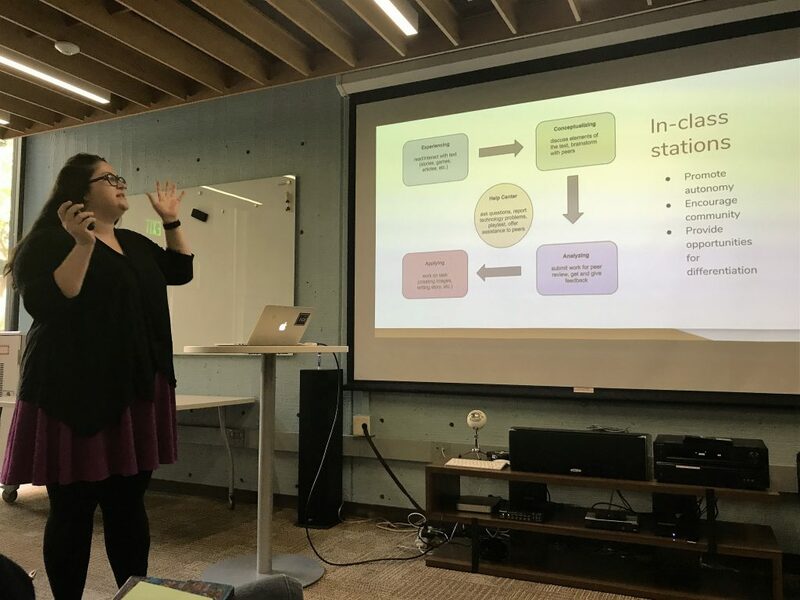 Because of this, I decided that I want to build a materials portfolio around using public radio in combination with other multimedia as a complement to a matriculated university oral skills curriculum to teach listening. I want to develop an array of activities that can be used to teach not only the language, but also the paralinguistic language that surrounds it. The project is still in its initial stages, but I’m looking forward to diving into it this coming spring. Can you tell us a little bit about why you chose the LTS program? What are you looking forward to doing in your remaining time in the program? I chose LTS for a number of reasons. 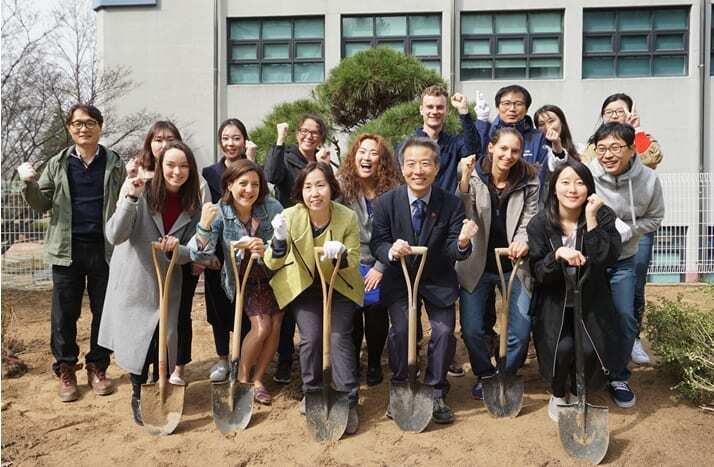 First and foremost, when I started to look at graduate programs a few years back, I reached out to Dr. Keli Yerian while I was teaching in Korea. 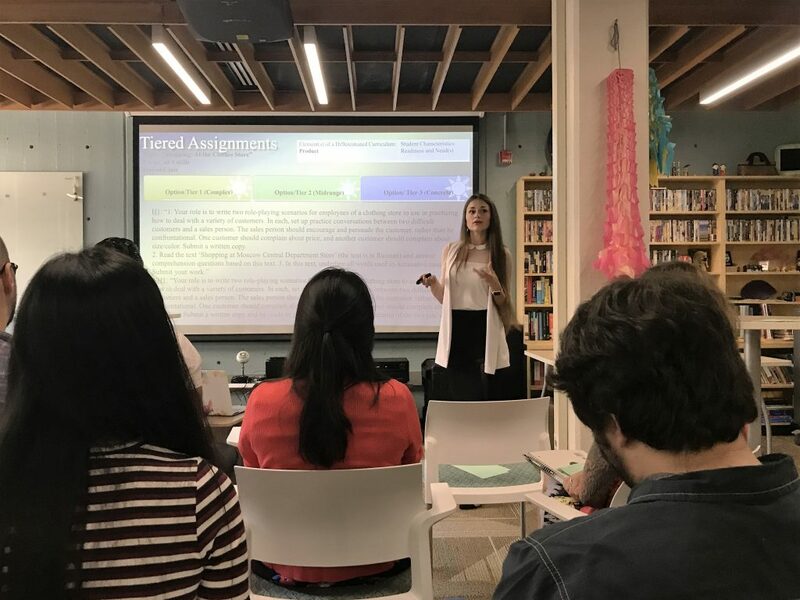 She helped to put into perspective the strengths that the LTS program had over other TESOL or theoretical linguistics programs. I liked that the degree focused on language teaching, and with that, I’ve been able to work on English, German, and a little bit of Korean in my coursework. Also, the multilingual approach meant that I would be able to work with a highly diverse and international cohort. This aspect allowed both my wife Jiyoon and I to apply and study together even though our language focus is different. I was also attracted to the fact that the program highlighted implementing technology into the language classroom and language assessment. I knew that these two aspects would be integral in my professional development. A final reason why I chose the LTS program is because of the other resources available on this large campus. I am currently taking an elective on grant proposal writing that I’m sure will help me to find funding for any future non-profit language programs that I decide to volunteer or work for. In the terms to come, I am looking forward to learning about assessment and how to teach pronunciation. Looking at my teaching now, I know that I need work in both of these aspects. I am also excited for the opportunity to start working on my MA project. The nice thing about being a student here at UO, especially in the LTS, is that opportunities open up for students all the time. Tell us about yourself. Where are you from? Where have you worked? Any hobbies? 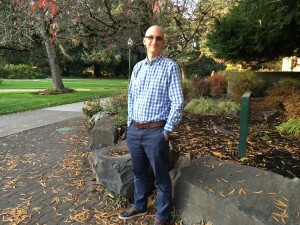 My name is Dan White, and I was born and raised in Portland, OR, USA. I definitely fall under the “nontraditional student” category. Out of high school, I worked random customer service jobs, until, one day I realized I was not living up to my potential. I decided, on a whim, to join the military. I joined the US Army as an ammunition specialist and shipped off to basic training in 2006. The Army had me all over the US as well as spending a year in Korea and nine months in Iraq. I finished my contract with the Army and started school at the University of Oregon in 2010. I received my BA in Linguistics in 2013. I had applied for the LTS program for the fall of 2013, but I decided to pursue some work experience by heading off to Korea to teach English. This was my second stint in Korea, but my first was spent with the U.S. Army, so I did not really get a chance to fully enjoy my time. The second time, I focused on learning the language and culture and truly experiencing every part of Korea. I made lifelong friends, and started a new hobby that is now a major part of my life: solving Rubik’s Cubes competitively. I started learning as a way to pass time, but I soon realized that I had an aptitude and passion for these puzzles. I incorporated them into my English classroom, and I used my after-school classes (where the curriculum was entirely up to me) to teach Rubik’s Cubes to my students. I used English to teach them how to solve the puzzle. This has become a vital part of my teaching methodology. I truly believe the best way to learn a language is not to focus on the language itself, but to focus on completing a task that is of particular interest to you. Then you are not learning the language simply to learn it, you are learning an entirely new skill and the language is simply the medium you are using to acquire that skill. After three years in Korea, I recently came back to the United States in September of 2016, and I started in the LTS program in the Fall of 2016. I am still adapting to living in the United States again, and I am very excited to continue pursuing my education. I love teaching, and I want to do everything I can to become the best language teacher that I can. You had an internship opportunity to work with students from Saint Gabriel’s College in Bangkok, Thailand. What was that like? I had a wonderful opportunity to work with a group of high school students from Thailand. I could immediately tell that they were very special. I taught them over the course of two weeks. Rather than focusing on language courses, I taught them cultural courses. I had a lesson on comedy and a lesson on expectations vs. reality. Their trip culminated in a presentation to LTS students in Dr. Trish Pashby’s “Teaching Culture and Literature” class. 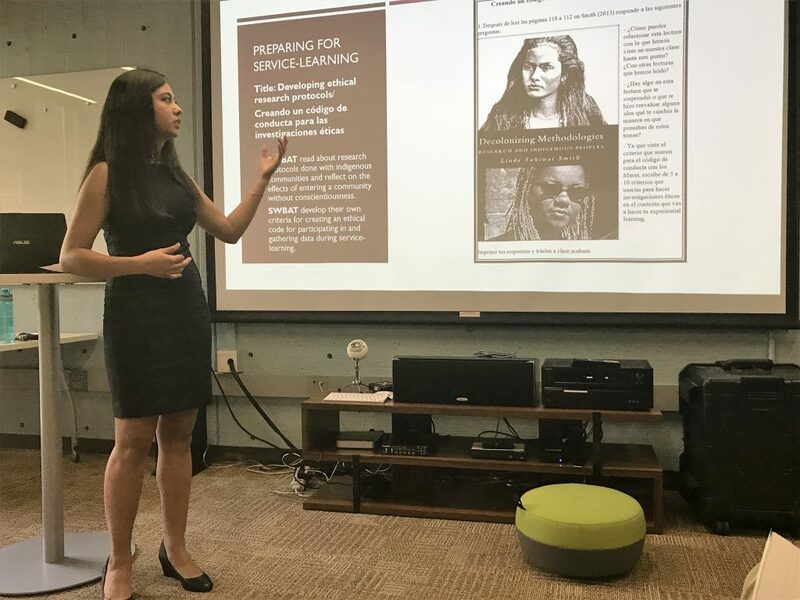 Prior to the actual presentation, we had a practice presentation. 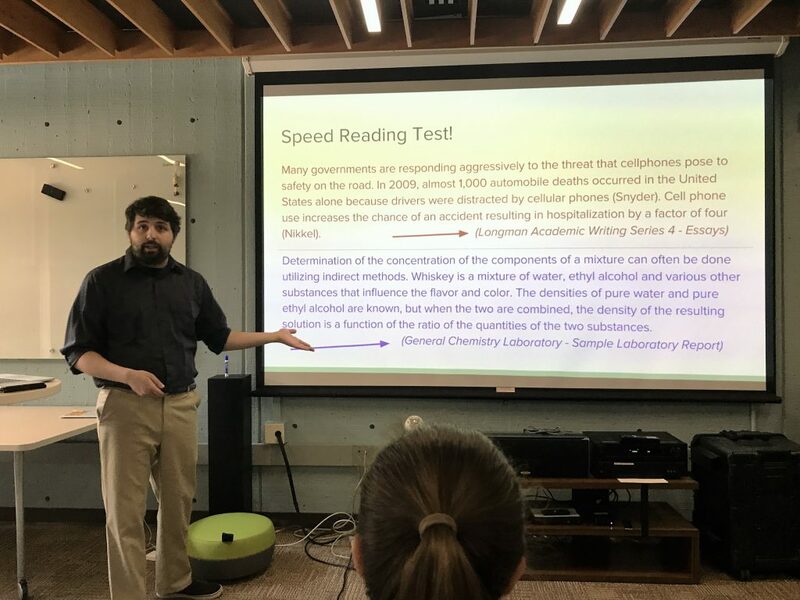 The students did well, but I gave them a lot of feedback. Their English was fine, but they needed to work on their presentation skills. They primarily lacked in smooth transitions from speaker to speaker and visually-appealing slides. The difference between their practice presentations and the presentations given in class was night and day. 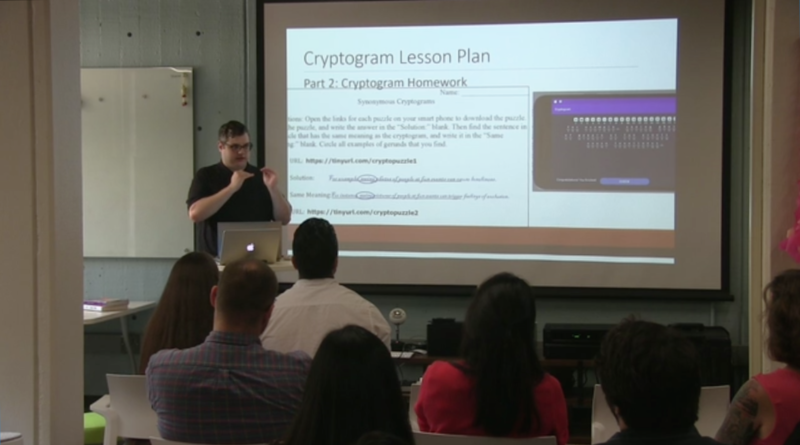 I was so proud to see the way they took my advice to heart and poured everything they had into their presentations. It was one of the most rewarding experiences that I’ve had as a teacher. Talk to us about working with the Fulbright Scholars. Mixed in among our LTS students in various classes are some amazing minds from across the world. We are lucky enough to share our Literature and Culture class with four Fulbright Scholars. Fulbright Scholars work on special scholarships to study in the United States while also teaching their native language and culture. The four we have are from Kenya, Pakistan, Vietnam, and Thailand. I had the opportunity to select some students for a lesson demonstration in my Multiliteracies course. I decided to invite all four of them, although I only needed to demonstrate my lesson for two students. All four showed up, and I taught them a lesson on American comedy. We discussed different comedy styles, I showed them various examples of American comedy. We also analyzed a specific comedy sketch, looking at various elements (camera angles, music changes, language choices) and discussed how they added to the comedic element of the video. Then they attempted to create their own comedic sketch. The lesson was very challenging, but the Fulbright scholars were more than up for the task. I was very impressed with how patient and receptive they were to my lesson. I think teachers make very good students as they know the challenges that a fellow teacher faces, and I was definitely lucky to have them in my class. 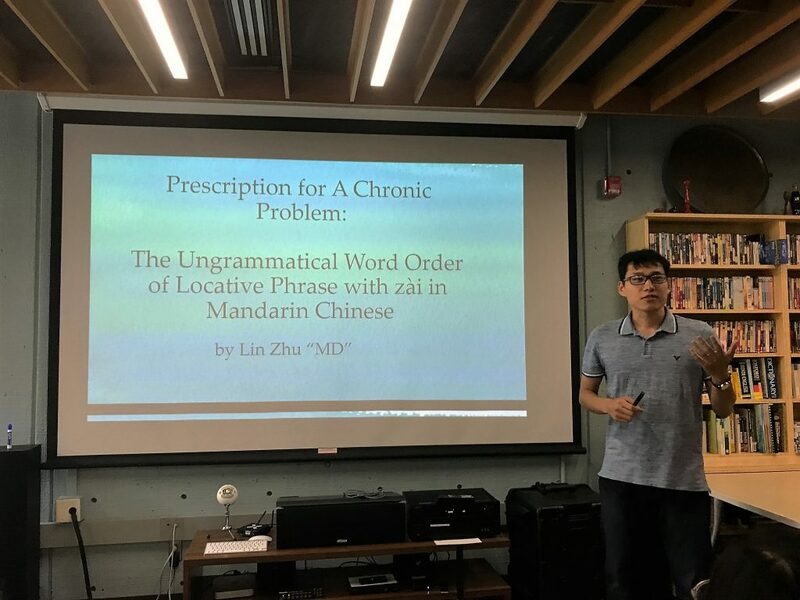 I also felt that they benefited a lot from this lesson as comedy is an extremely difficult topic to understand for second-language learners as there are both linguistic and cultural hurdles. Overall it was a great experience with them. You’re also an intern with CASLS, right? What can you tell us about that? I am currently working as an intern with the Games2Teach project of the CASLS (Center for Applied Second Language Studies) program. My job is to play commercial video games and assess how they can be used by language teachers to facilitate language learning. I look at both language and cultural aspects of these games that could benefit students. I assess the age appropriateness, language difficulty, and overall genre of the games. This experience has been very rewarding, as my master’s project will be focused on developing a language teaching game template that teachers can adapt to their lessons. I have found many elements from the games that I have tested that I would love to incorporate into my own game. Last but not least, tell us about the Cubing Club! 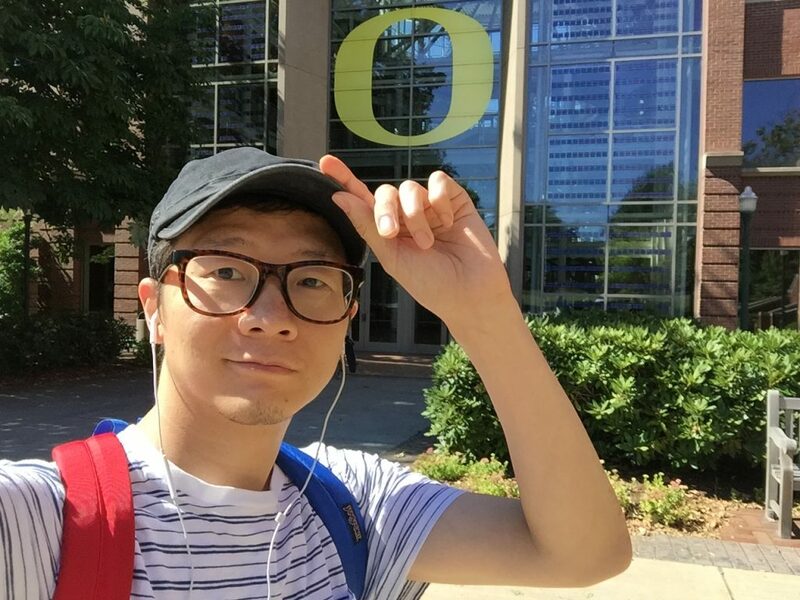 The UO Cubing Club did not exist, so I decided to go through the steps to start it. Students need hobbies to pass the time, and cubing is a great one. I love teaching people how to solve the cube. I get to see the excitement on their faces when they are finally able to make the last turn that solves the cube. It is a lot like the joy I get in seeing my language-learning students progress. We also help people who can already solve to transition into competitive solving. 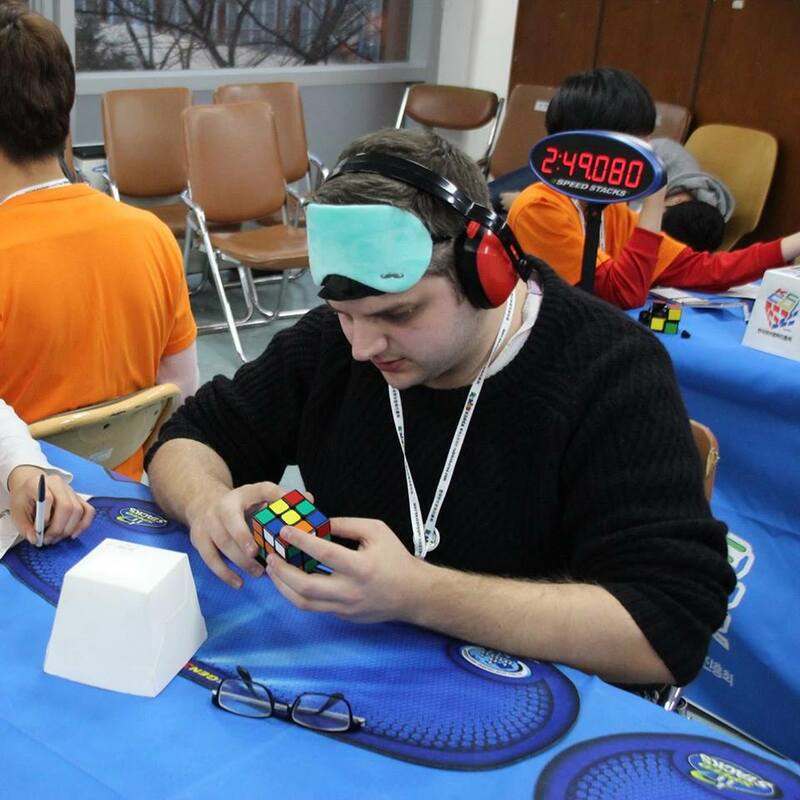 They can learn larger cubes (4×4, 5×5, etc), or they can add new tricks to the normal 3×3 (blindfolded solving, one-handed solving, etc). Meeting with the club is a great stress reliever for me. I hope the club continues to grow throughout my time here at UO. If you are interested in joining, look up “UO Cubing Club” on OrgSync! SeungEun Kim is originally from Korea. 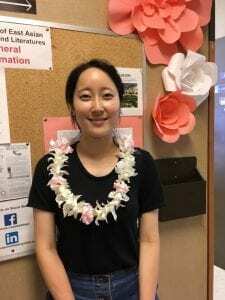 Like Sue Yoon (see our earlier blog post in November), she is pursuing an MA in LTS and an MA in East Asian Languages and Literatures at the same time. You were an English major before entering the LTS program. What attracted you to English? English was the first language that I fell in love with. So majoring in English was the one thing that I really wanted to do no matter what. Since I like reading literature in both Korean and English, I wanted to spend my undergraduate years reading and exploring my thoughts about the books that I read, and being an English major really made my dreams come true. I was able to spend my years as an undergraduate reading a lot of books, but more importantly, I learned how to read literature from more critical perspectives. I am glad that I have a background in English literature from my years as an undergraduate since I believe it has prepared me for how I will go about educating my future (language) students. Now you are doing two concurrent MA degrees in LTS and East Asian Languages and Literatures (EALL). How did you shift over to a love of Korean as well? Since being a foreign student here in America, I am proud that my national language of Korean is being taught here. I think my patriotism and love of my culture motivated me a lot to want to teach Korean. Also, as a bilingual speaker, I wanted to be more available to others who are learning Korean. Since I am a native speaker of Korean, I thought it would be great if I could be a source for those studying the language here. What do you like best about teaching at the university? 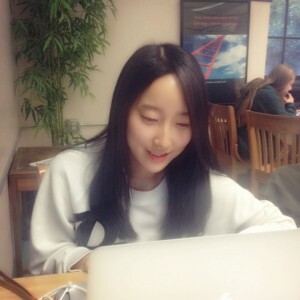 I am thankful that I have the opportunity to teach Korean at a university in America. This opportunity has allowed me to collaborate with both international and American students together in my classes. Although my students are from different countries and cultures, and speak different languages, it has been great to see how they come together as Korean language speakers. 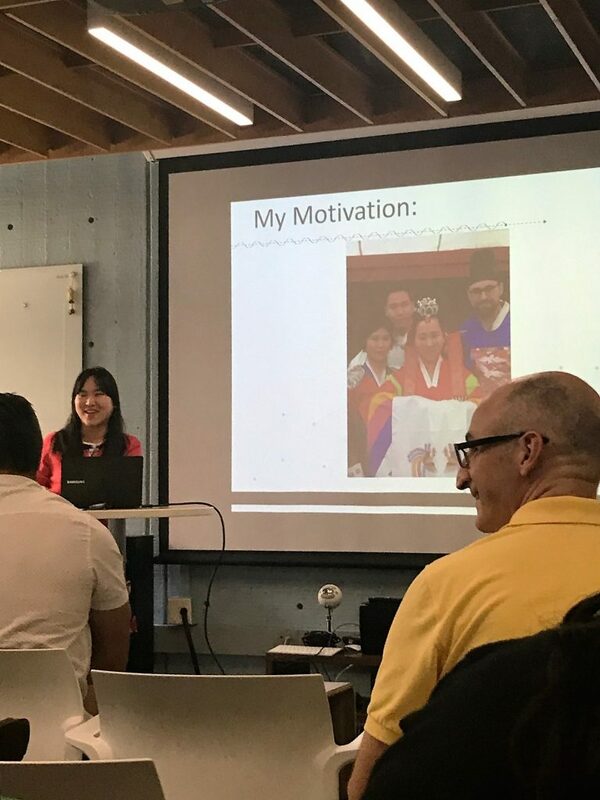 When the students have the will to learn Korean, their passion for the language and love of Korean culture and literature really boost their improvement and are a great source of motivation. 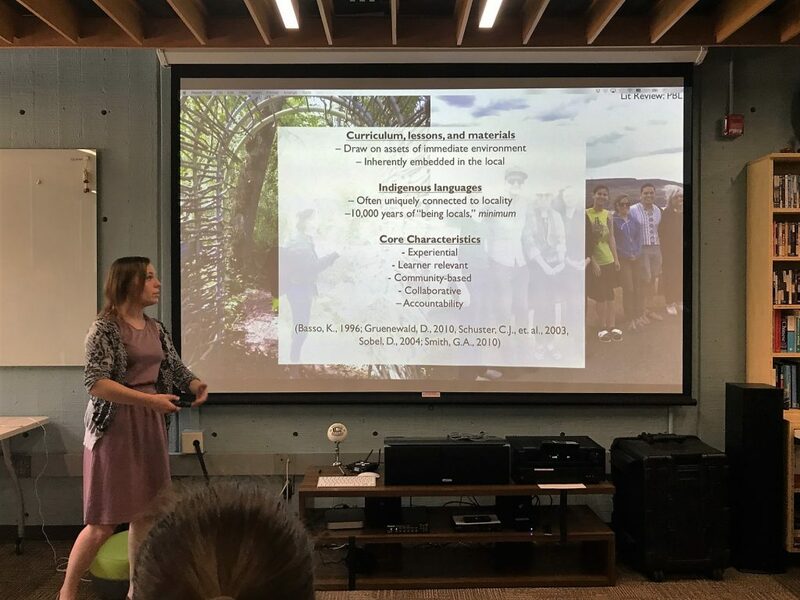 Moreover, teaching at the university is even more special to me because not only can I teach, but I can continuously increase my knowledge as well. What is your idea for your MA project you will do in LTS? I am interested in teaching language using literature. I am researching how literature as an authentic material should be used in the language classroom and appropriately chosen depending on the students’ language proficiencies. What advice would you give applicants who might want to do concurrent MA degrees like you are? The first advice I would give someone, based on my own experiences, is to believe in yourself when you are very busy and things are extremely stressful from all the classwork that you have to do. You need to stay strong, keep a positive outlook, and believe in yourself that you can do it. Know that you are not alone, and that there are people like the LTS program director, your advisors, and other teachers who are here to help and support us. How are you connected to the LTS program? I teach courses on Korean and East Asian linguistics in the department of East Asian Languages and Literatures (EALL). 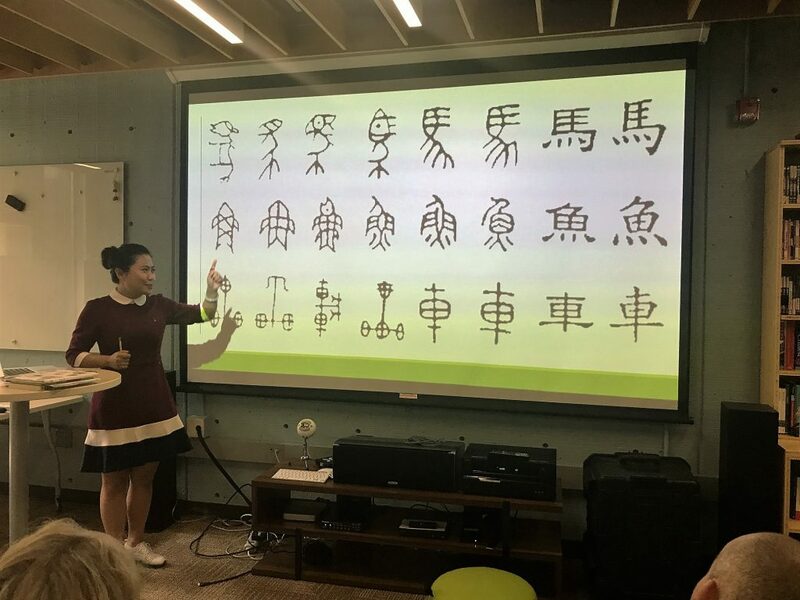 LTS students who are interested in teaching East Asian language often take our courses as electives, and I sometimes advise LTS final projects. Also, we currently have two students who are doing concurrent MA degrees in LTS and Korean Linguistics and Pedagogy in EALL. Are the classes you teach related to your own research? Very much so! I’m interested in socio-cultural language learning and teaching, and I incorporate these perspectives into my second language acquisition and pedagogy classes, such as EALL 542 Second Language Acquisition of Chinese, Japanese and Korean and EALL 543 Chinese/Japanese/Korean Pedagogy. I also research multimodal aspects of politeness in Korean, which relates to my class EALL 586 East Asian Sociopragmatics. What advice would you give to applicants who are considering a concurrent MA degree in EALL? First, remember that the EALL deadline for grad admission is earlier than the LTS date (EALL January 1, whereas LTS is February 15)! In your application it is really important to articulate a clear reason for wanting to do a concurrent degree and be a member of both programs. From our side, we really want to see a clear reason or goal for wanting to study Korean linguistics and pedagogy. Many Korean students who apply to LTS focus on English language teaching (EFL), but some of them also become interested in teaching Korean. Why do you think this happens? 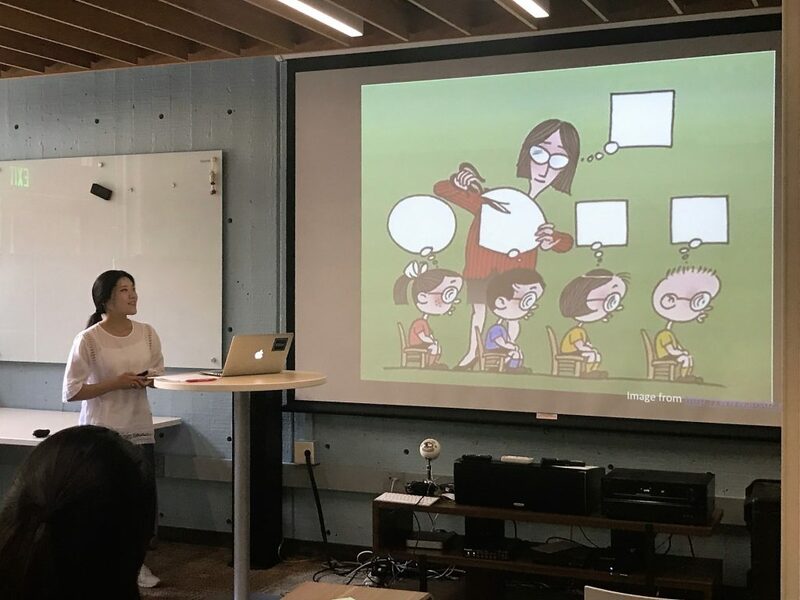 In Korea, the idea of foreign language teaching is focused so much on Koreans needing to learn English, and the awareness that people from other countries need to learn Korean is not so high. But coming here broadens student’s horizons. Korean students get to know about our strong Korean language program, and meet students who are learning Korean as a second language, possibly for the first time. They get to see the importance and value of Korean language education. Besides, even if you plan to become an English teacher, having experience of teaching your native language (Korean) will give you a different perspective on what it means to teach and learn a second language. What do you enjoy about working with graduate students? 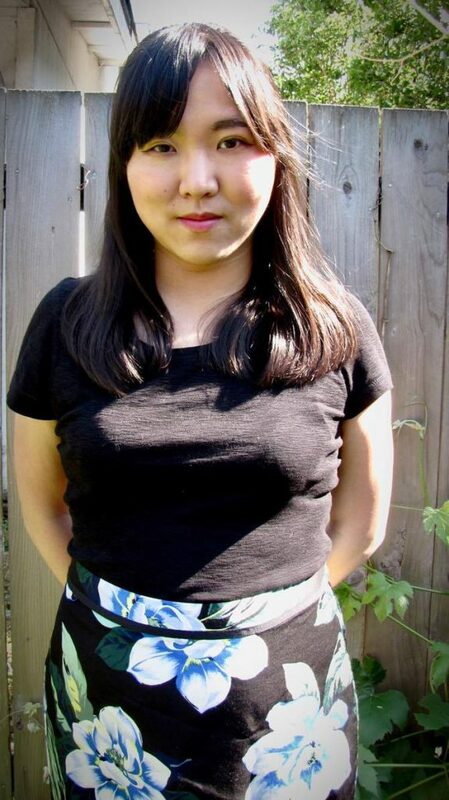 Sue Yoon is originally from Korea and completed her Bachelor’s degree in Linguistics and the Certificate in Second Language Acquisition and Teaching (SLAT) at the U of O. She is now working on concurrent MA degrees in Linguistics LTS and East Asian Languages and Literatures. You are doing concurrent MA degrees in both Linguistics with a language teaching specialization (LTS) and East Asian Languages and Literatures (EALL). Can you tell us why you chose to do both degrees? How do you benefit from each department? 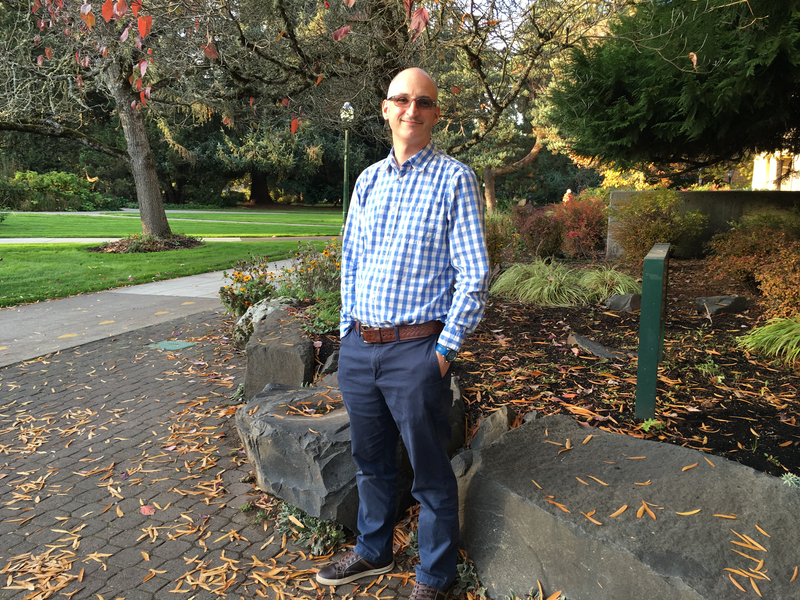 I got my undergraduate degree in linguistics from the University of Oregon and wished to continue studying linguistic characteristics of my native language in depth. I believed that having sufficient knowledge of linguistics would benefit me as a language teacher, which has always been a dream of mine, so I decided to apply to the M.A. Korean linguistics and pedagogy program at the University of Oregon as well as to LTS. I really enjoyed learning different language teaching techniques and approaches from a variety of LT courses at the undergraduate level, and they helped me broaden my perspective of language teaching to a large extent. I certainly benefit from both programs in many different ways. 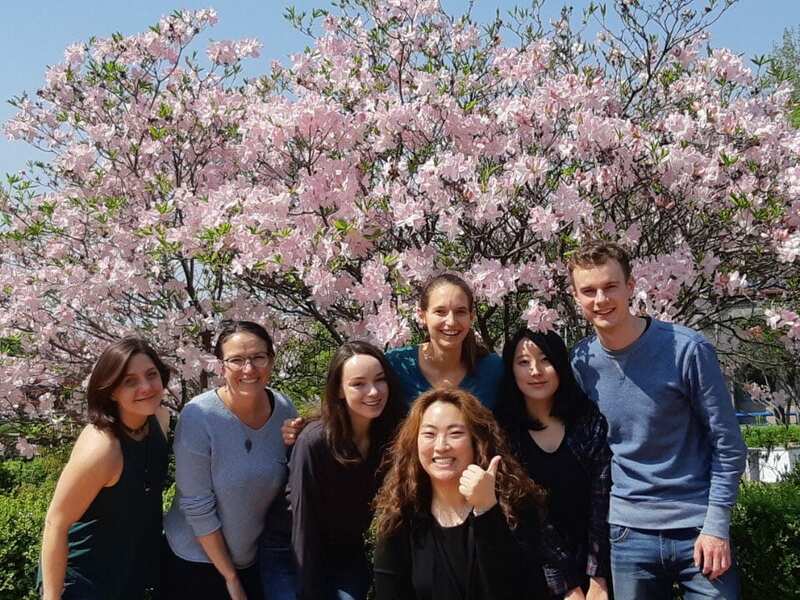 They perfectly match my areas of interest and allow me to develop a deeper understanding of language teaching and the Korean language system in order to become a more successful Korean language teacher. It is also intriguing to learn both theoretical knowledge and practical knowledge from the two programs. There are a number of benefits of being a language GTF at the University of Oregon. First of all, I can gain professional knowledge about my fields of interest and more teaching experience simultaneously during my graduate studies. I also find it very helpful to apply what I have learned from the LT courses to my own teaching as the LT courses have certainly helped me understand what makes a good language teacher. Moreover, learning various aspects of the Korean language system from EALL (East Asian languages and literatures) courses helps me to better explain features of the Korean language to my students in the most effective manner when teaching at the university. Finally, I am so glad that I got the chance to meet my awesome students who are learning Korean at the University of Oregon! For you, what is similar or different about teaching English vs. teaching Korean? I have taught both English and Korean at a few different places in Korea and the U.S. I found teaching English quite different from teaching Korean. As I was teaching Korean, I have realized that being a native speaker of the language does not mean that it is easier to understand the language system. I learned English as my second language, and this helps me identify and understand areas of potential difficulty faced by learners of English as I underwent the same language learning. 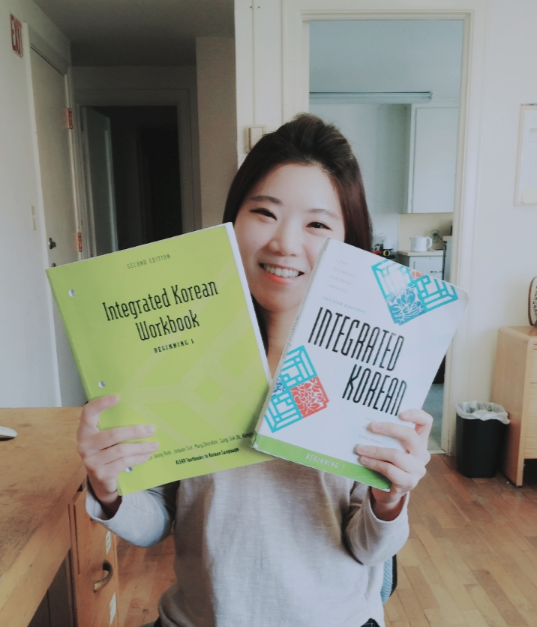 I usually feel more comfortable and confident when teaching Korean as it is my native language, but it is sometimes quite difficult to provide my learners with what they really need in order to understand a specific aspect of the language and understand their problems and difficulties from their perspective. However, I have really enjoyed the experience of teaching both languages! 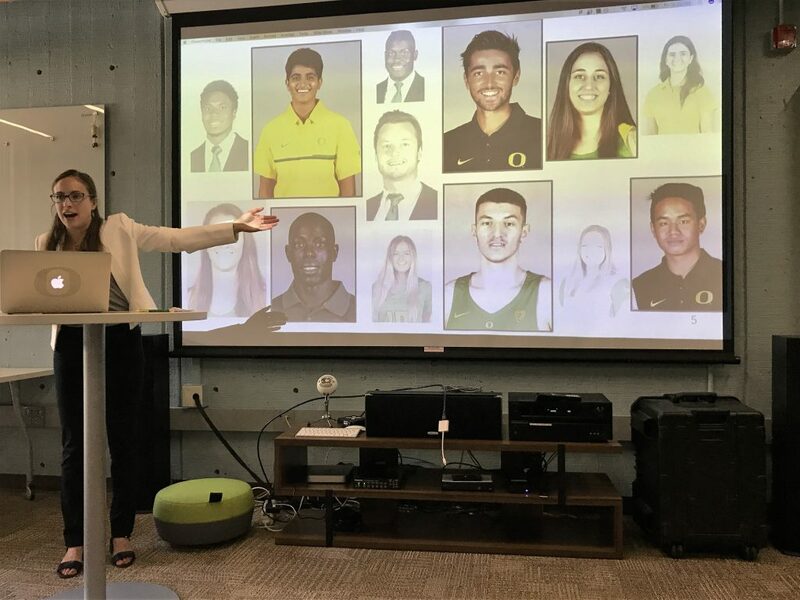 There are a lot of great courses provided at the University of Oregon, and I believe that being able to do a concurrent MA degree can help students further broaden their knowledge in two different areas of study that they are interested in. It has been a wonderful experience taking a variety of courses and meeting such a great group of people in the two programs!